VLM (Variable Load Module) to test in accordance with IEC 60601-2-4. 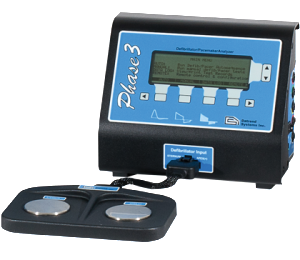 Phase 3 is the first Defibrillator/Pacer Analyzer specifically designed to test Pulsed Multiphasic defibrillators. Test Monophasic, Biphasic and Pulsed Multiphasic Defibrillators, AEDs and Transcutaneous Pacers with better than 1% accuracy on either line or battery power. Battery provides up to 24 hours or continuous operation and detachable paddle plate provides easy hands-free testing. USB Communication capability allows real-time waveform capture and efficient data transfer to your PC. Capture high-resolution signal data to a PC running Phase3pc software. Store up to 80 test records and up to 10 defibrillator discharge waveforms as Wave Records. Use Phase 3pc companion software to create and edit autosequences, download and store test data and wave graphics to your PC. Phase3pc companion software is included as a standard accessory. Add our exclusive VLM (Variable Load Module) to test in accordance with AAMI DF-80 and IEC 60601-2-4. Phase 3 tests Monophasic, Biphasic and Pulsed Multiphasic Defibrillators, AEDs and Transcutaneous Pacers with better than 1% accuracy on either line or battery power. Detachable Paddle Plate provides easy hands-free testing. Battery provides up to 24 hours of continuous operation. USB Communication capability allows real-time waveform capture and efficient data transfer to your PC. Capture high-resolution signal data to a PC running Phase3pc software immediately after discharge. Phase 3 provides storage for up to 50 Test Records and up to 10 defibrillator discharge waveforms as Wave Records. Our optional, exclusive VLM allows testing defibrillators at maximum energy with selectable loads from 25 to 175 ohms, in accordance with AAMI DF-80 and IEC 60601-2-4. High-resolution wave graphics and test data are obtained with Phase 3VL software — a standard accessory to the VLM. Included as a standard accessory, Phase 3pc allows you to create and edit autosequences, download and store test data and wave graphics to your PC. Waveform Width: 10, 25, 40, 100, or 200 msec. USB Port: Type “B”, USB 1.1 or USB 2.0 compatible.